Prices include supplying food which is usually the brand that your cat/cats normally eat. The only exception is Prescription Diets which we ask our clients to provide. Special diets can be catered for. Our charges are per day or part of a day. We do not take credit cards, payment has to be made by cash or cheque. In all instances please contact us to confirm availability. A required booking form will be sent to you for completion. Early booking is advised but we can take cats at short notice providing we have a vacancy. Collection & Delivery service is available, please ask for details. A full day’s board is charged for the days of arrival and departure, this allows for the essential disinfection and preparation of the chalets. No deposit is required, all fees are payable on collection. In the event of owners returning before the end of the period for which they booked, the full period will be charged. 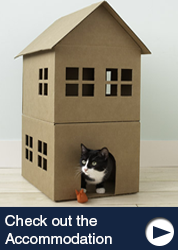 There is a minimum charge equivalent to three days board for one Cat, except at Christmas when the minimum charge will be equivalent to six days board for one cat. If a booking is cancelled with less than 21 days’ notice, there will be a cancellation fee equivalent to the minimum charge. Owners must agree that in the case of illness or suspected illness, a Veterinary Surgeon will be consulted and, if necessary, will be visited to carry out such treatment as they consider advisable. (This will usually be your own vet.) In such a case each cat is insured for £1500 for Veterinary treatment costs any amount over this must be paid by the owner. Pet Plan Terms & Conditions apply. Cats must be vaccinated for Feline Enteritis and Flu. We will need to see a certificate. Whilst every care and precaution is taken, responsibility can only be accepted at the owner’s risk.